For perfectionists, criticism feels like your flaws are being exposed. You work so hard to conceal them, that it’s extremely painful to have them brought to light. 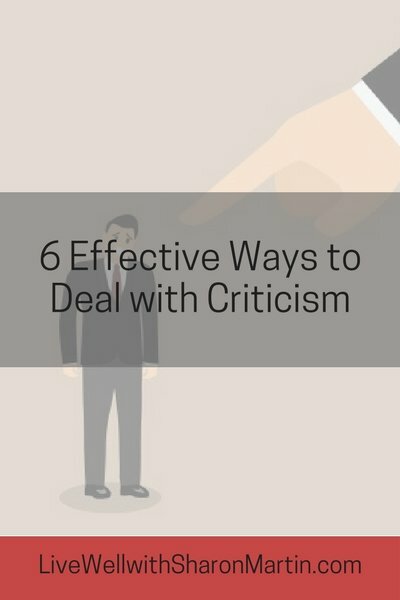 How do you react to criticism? Some people seem to be able to shrug it off. Others may internalize the criticism and deeply believe it is the truth. You may cry or feel worthless. As a result you may take fewer chances and “play it safe.” Some lash out in anger and defensiveness. You may even be highly critical of others. Since we can’t avoid criticism, we need to learn to deal with criticism. 1. Consider the source. Do you value the criticizer’s opinion? Does this person have a pattern of being helpful or hurtful? Criticism from a close family member should carry more weight than criticism from an anonymous stranger. 2. What kind of criticism is it? Some criticism is just plain mean. Other forms of criticism are constructive. 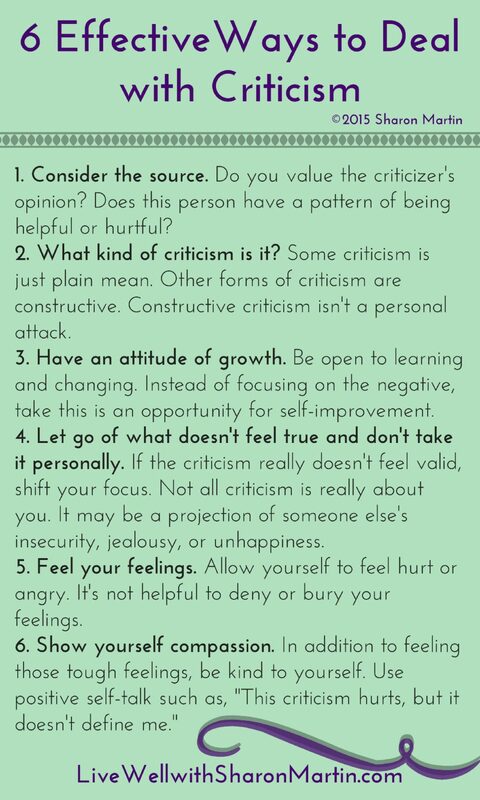 Constructive criticism isn’t a personal attack. It should be helpful and move you toward improvement. It shouldn’t demoralize you. 3. Have an attitude of growth. Be open to learning and changing. Instead of focusing on the negative, take this is an opportunity for self-improvement. 4. Let go of what doesn’t feel true and don’t take it personally. If the criticism really doesn’t feel valid, shift your focus. Don’t dwell on it and over-analyze it. Try to accept that it may not be accurate and concentrate on your strengths. Not all criticism is really about you. It may be a projection of someone else’s insecurity, jealousy, or unhappiness. 5. Feel your feelings. Allow yourself to feel hurt or angry. It’s not helpful to deny or bury your feelings. Talk about them, write about them, or let them out creatively. Then move on. Your self-worth isn’t determined by how many people like you, your work, or your choices. Be open to feedback from those your respect, but also know that you can’t please everyone and that’s okay. 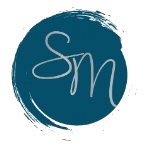 ©2015 Sharon Martin. All rights reserved. Originally published on PsychCentral. Thank you so much for reading. I’m very happy that my posts are helpful. There will be more to come, of course!